Easy Recipes to Make Onigiri Japan Good .onigiri or also known as a rice ball is a fusion cuisine cooked glutinous rice with fluffier then clenched round with sliced ​​omelet additional inserts on the inside and a layer of nori or seaweed on the outside. Rice is clenched on making onigiri directly using the hand that previously given a sprinkling of salt so that the fist onigiri rice which has become this feels a bit salty. As for the content of the material inserts onigiri actually not glued to be using sliced ​​omelet, but also can be replaced with inserts shredded, sliced ​​meats or other ingredients of your choice. More details about the making onigiri can you see in the recipes easy to make delicious Japanese onigiri below. Combine ordinary rice and glutinous rice (the lump) then wash and soak in water for up to 5 minutes in length then drain. Next cook the rice with the addition of new water. Wait until soft and noticeably fluffier rice then remove and let cool. Take a taste of rice and clod-clod using clean hands that have previously been laced with salt to taste. Sisipi sliced ​​omelet in the middle of rice were clenched and paste nori on a rice ball. Onigiri is already finished and ready to eat. It is easy to make onigiri Japanese dishes that can be enjoyed as a breakfast menu, lunch to school or first aid at this rumbling stomach. Good luck! 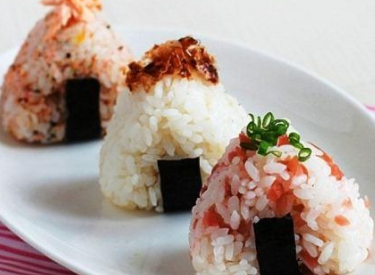 0 Komentar Untuk "Easy Recipes to Make Onigiri Japan Good"